Stock photo of a rainbow in the mist above the boardwalk at Kakabeka Falls (aka the Niagara of the North) along the Kaministiquia River during a spring flood, Kakabeka Falls Provincial Park near Thunder Bay, Ontario, Canada. 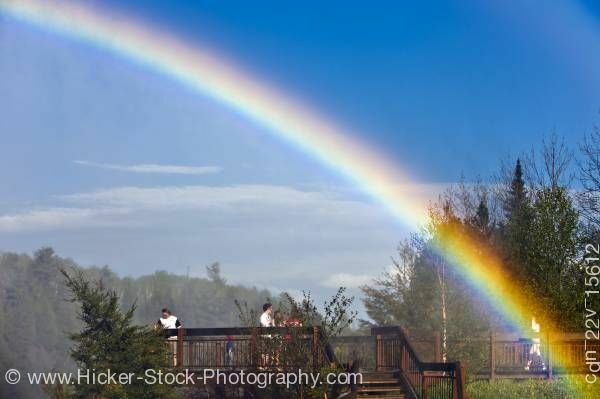 This stock photo includes a rainbow in the mist above the boardwalk at Kakabeka Falls (aka Niagara of the North) along the Kaministiquia River during a spring flood, Kakabeka Falls Provincial Park near Thunder Bay, Ontario, Canada. Kakabeka Falls plunges 40 metres over sheer cliffs and some of the oldest fossils in the world. Below the falls is a dramatic gorge carved out of the Precambrian Shield by the melt water from the last glaciers. The ancient, volcanic rock over which the water tumbles holds many secrets. From beneath its layers, 1.6-billion-year-old fossils have been unearthed. Since 1904, the river has been tapped to produce a steady flow of hydroelectric power.